Looking for a great way to spend the holidays and make some wonderful family memories at the same time? 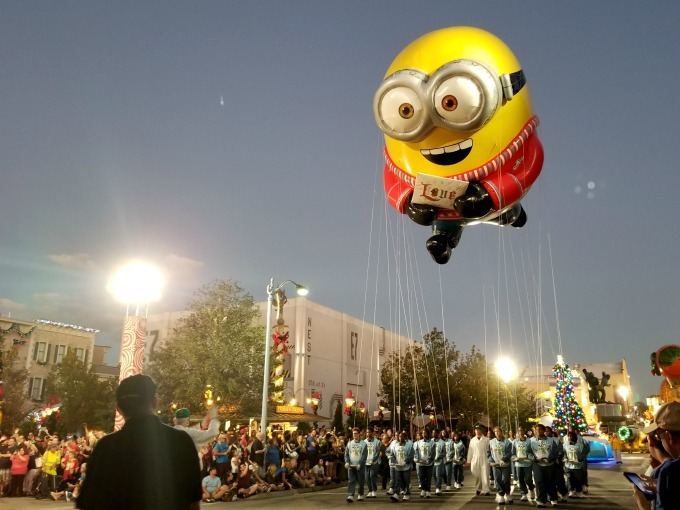 Pack your bags and plan to visit Universal Orlando Resort for Christmas. 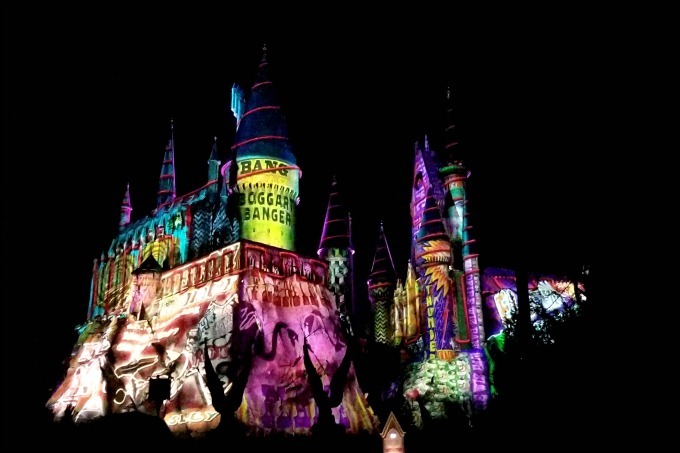 From hanging out with the Grinch to taking in the amazing light show at Hogwarts Castle, you’ll find plenty of fun ways to celebrate the holiday. Thanks to Universal for providing us with tickets to enjoy the parks. All opinions are 100% my own. When I started planning our trip to Universal Orlando Resort, we were going to celebrate my daughter’s 10th birthday. 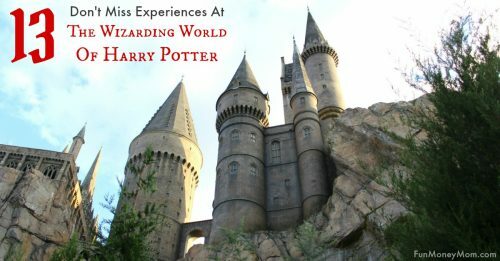 She is a HUGE Harry Potter fan and has been begging to take a trip to see the Wizarding World Of Harry Potter. We were already excited but things got even better when we found out that our trip coincided with the start of all the Christmas festivities. How fun is that! From meeting the Grinch to holiday parades, being at Universal was such a great way to kick off the holidays. Find out what we loved most and why we now want to go back every year at this time! 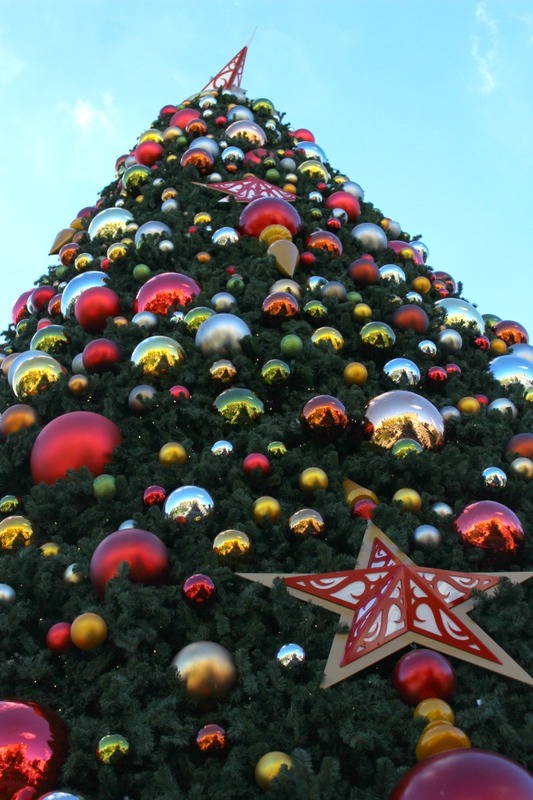 From the over-sized elf that greets you at the entrance of Universal Studios to the giant Christmas tree in Universal Studios, holiday decor is everywhere. The lampposts even have their own Christmas hats. 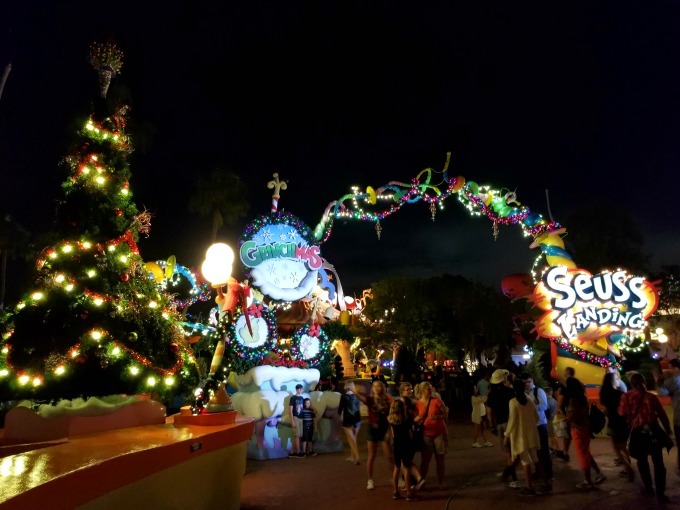 Our favorite holiday decor was at Seuss Landing…it was seriously decked out and looked amazing! There were Christmas lights in every direction and we had fun just wandering around and checking it all out. 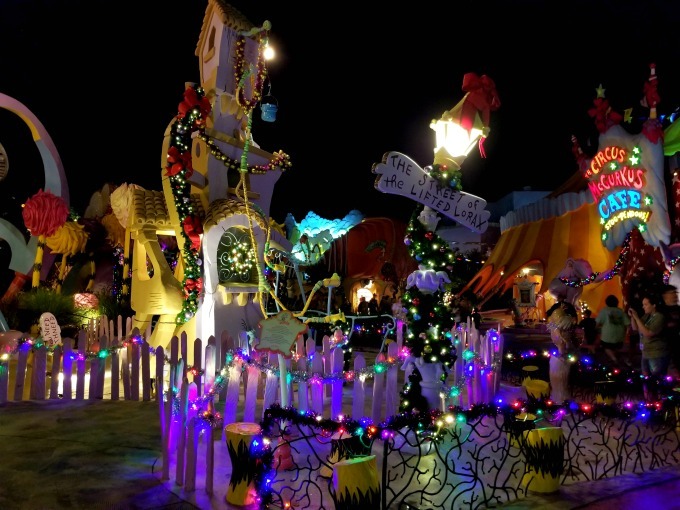 Combined with the whimsical atmosphere that you already get in Seuss landing, we felt like we’d been dropped right in the middle of a Christmas story. If only they would come decorate my yard like this! Nothing says Christmas like the Grinch, right? We got really lucky too…just as we finished taking pictures with Thing One and Thing Two, the Grinch showed up right behind us and we were first in line for pictures. The girls were so excited to meet one of their favorite storybook characters and even my hubby got in on the act. The Grinch was keeping an eye on him though…he must know trouble when he sees it! You can also meet the Grinch with Max at the nightly tree lighting, decorate ornaments and enjoy story time with Cindy Lou Who. 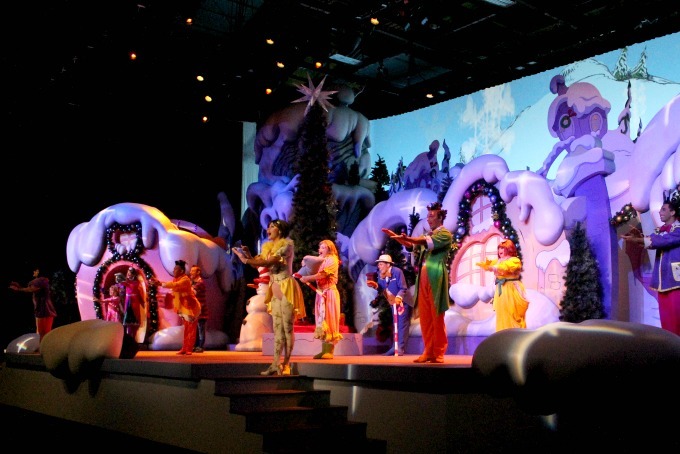 Don’t forget to catch the Grinchmas musical while you’re there! I’ve always wanted to see the Macy’s Thanksgiving Day Parade but New York City is expensive…and cold! This was a great alternative. It was pretty cool to park ourselves in Universal’s replica of NYC and watch the parade go by. My girls loved seeing some of their favorite characters on the floats but the real stars of the show were the balloons. With a giant Minion, Donkey and more, it was probably the closest I’ll get to the real thing! 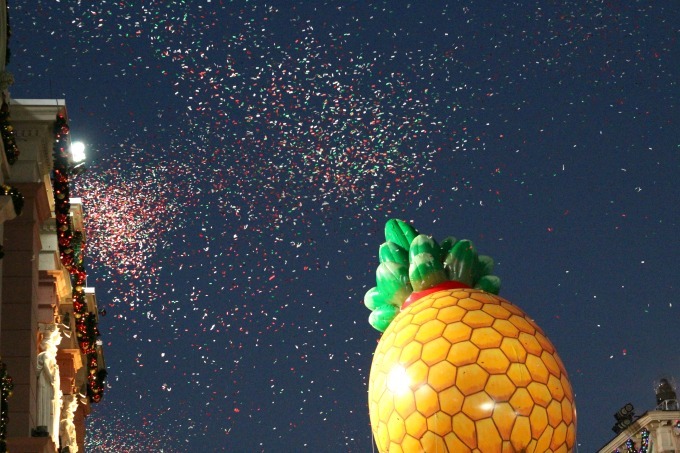 I was so into the parade that I didn’t even notice the fun confetti until my hubby pointed it out. 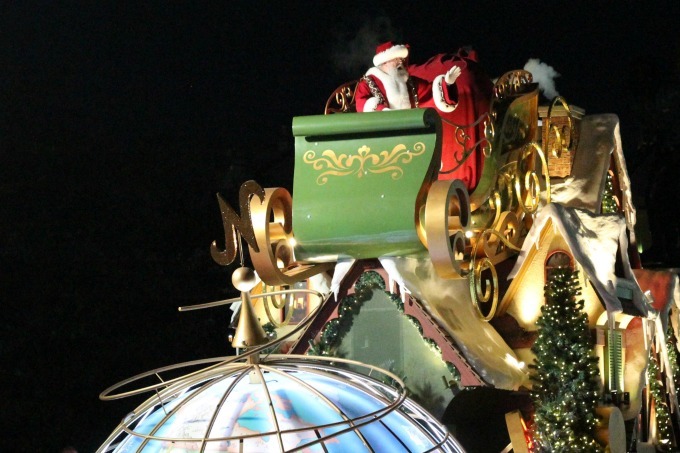 Of course, it wouldn’t be a holiday parade without Santa and he finished out the parade. I don’t know about you but when I see Santa for the first time, that’s when the Christmas season officially begins for me! I know some people like to skip the parades to take advantage of the shorter lines at attractions but I’d recommended sticking around for this one! 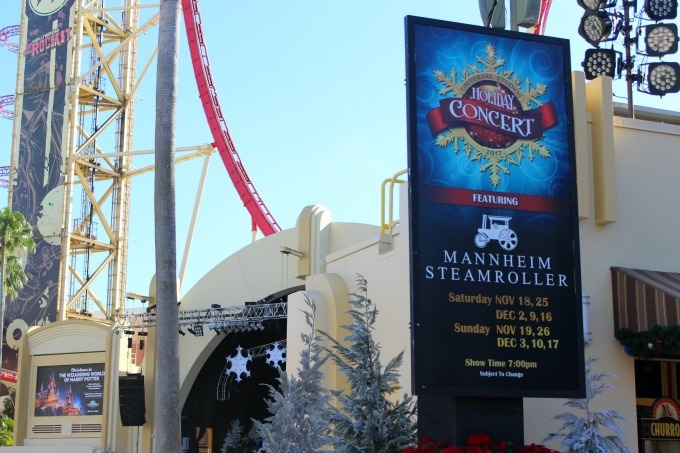 If you’re visiting on a weekend through mid-December, you can catch Mannheim Steamroller in concert. Known for their Christmas music, it’ll definitely put you in the holiday spirit. It’s also a great chance to relax after spending the day walking from one end of the park to the other. Grab a drink, find a chair and stay for awhile. I’ve saved the best for last! THE BEST! The Magic Of Christmas At Hogwarts is a spectacular light show that takes place at Hogwarts Castle every night from dusk until the park closes. Though this is the first year they’ve done it, I’m sure it won’t be the last. We were there for the debut and it was so popular that they had to let people enter in waves. It was definitely worth waiting for though and if you’re there, this is one attraction you absolutely can’t miss! Don’t just take my word for it…here’s a snippet of what you’ll see. Pretty amazing, right? Now you can see why we loved it so much! 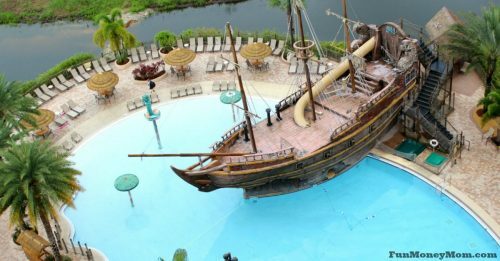 If you’re planning your own visit, you can save money on your theme park tickets by buying them through Undercover Tourist. 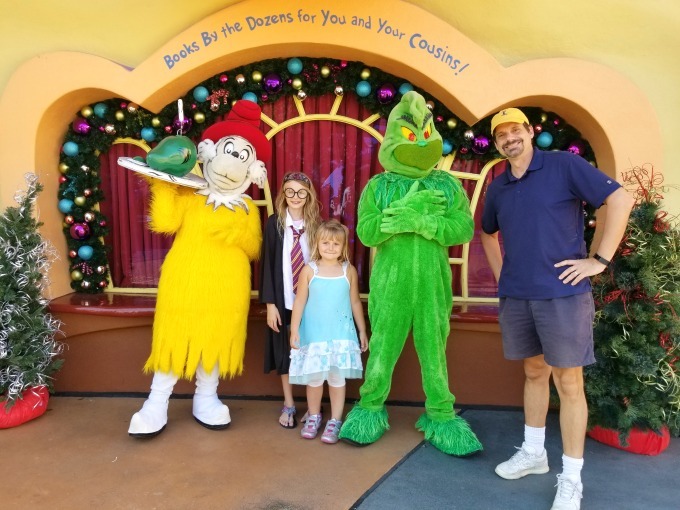 We would have had the time of our lives any time of the year but getting lucky enough to visit Universal Orlando Resort for Christmas made our trip that much better. We made some amazing memories and might just have to celebrate the holidays like this every year! 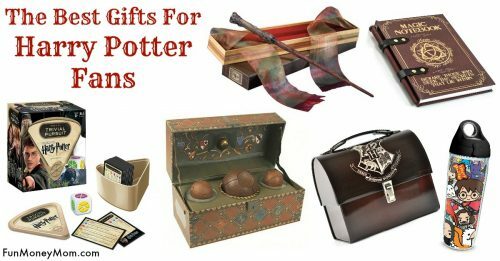 Love Harry Potter? Check out our video from The Wizarding World Of Harry Potter. I really want to go! 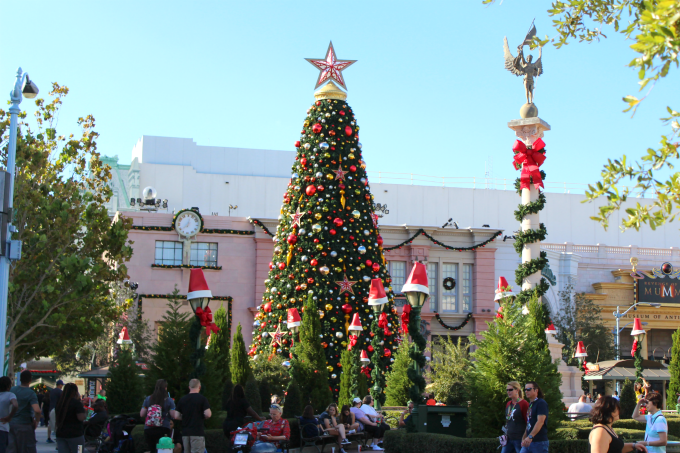 We will be in Orlando in January and I think they still have decorations up at that time. I can’t wait!